On Wednesday, 11 February Shane and I attended the one night only exhibit of Salvaged Relatives, three unique state artist books by two of our favourite works on paper artists, Gracia and Louise. It was a privilege to view all three works: SALVAGED RELATIVES, EDITION I (RED), EDITION II (YELLOW) and EDITION III (BLUE) before they take their places in prestigious public collections, namely the Baillieu Library at Melbourne University, the State Library of Victoria and the State Library of New South Wales. 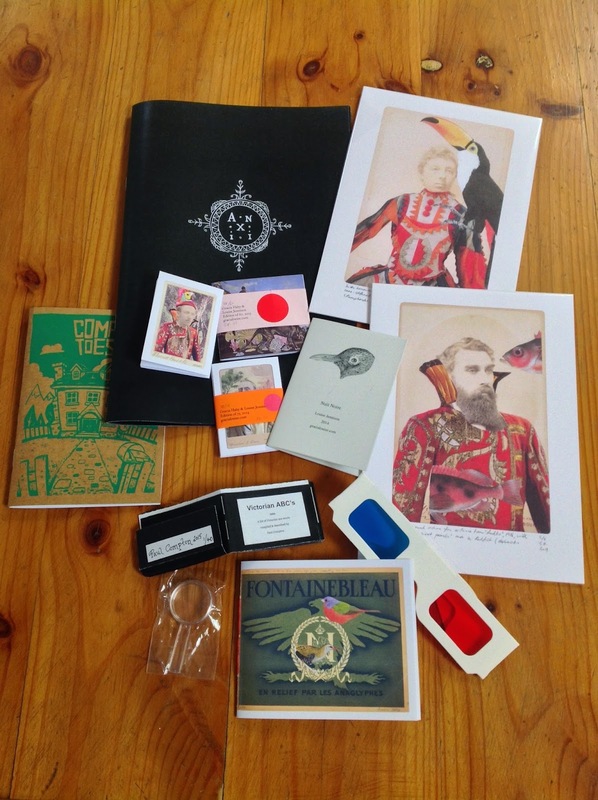 As a souvenir and memory-jogger of these exquisite works, I was able to acquire a couple of zines (one for myself, the other for a fellow G & L admirer) as well as two limited edition prints of the exotic Salvaged Relatives. That same night I bumped into my dear friend Paul Compton, another talented artist and zinester. When Paul and I caught up recently, I was thrilled when he gifted me with number 1 in the editions of his two latest zines (see the large and small black books in the second photograph below). Last Sunday my haul increased at the annual Sticky Institute Zine Fair at Melbourne Town Hall, where I acquired more zines from Gracia and Louise and a great little zine titled Coma Toes by Jase Harper. Doubtless inspired by the above, I've been on a bit of a zine-making spree of late. 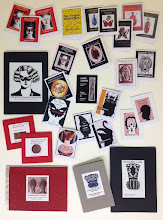 Several new publications are under way, and the mini-zine, Dark Dames, is nearly completed. I'll be developing the others over the next little while in tandem with other projects, most notably the fledgling homo-insecta paintings on wood, progress views of which are regularly documented on my Art Blog. PANDORA, Australia’s Web Archive, an initiative of the National Library of Australia, has selected this site for preservation. To learn more about PANDORA, click on the logo. 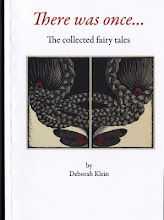 MWP publications include our first book, 'There was once...The collected fairy tales', and the 'Tall Tales' series of unique artist books. Among our limited edition zines are: 'A Short Book about Long Hair', 'Material Girls', 'The Moth Woman Vigilantes', 'The Little Black Hair Book', 'Poker Faces', 'The Moth Woman Vigilantes UNMASKED' and 'The Moth Women Vigilantes ROGUES GALLERY'. MWP artist books and zines can be found in the collections of the National Library of Australia, the State Library of Victoria, the State Library of Queensland, the National Gallery of Australia, Bank Street Arts, Sheffield, UK, the Brooklyn Art Library, Brooklyn, NY, Winsor & Newton Australia and the Baillieu Library at Melbourne University. One-of-a-kind artist books, ink and acrylic paint, cloth bound, 80 x 15 cm open). From the 'Tall Tales' series of vertical concertina books, 2013. Left and second from left: collection of the artist, centre: collection State Library of Queensland, right: collection State Library of Victoria. To view other books in the series, click on the image. MWP zines in the permanent collection of the National Library of Australia. Click on the image to see a wider selection of MWP limited edition books and zines. (Click on image to see excerpts as a slideshow on Flickr.) 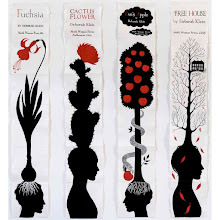 Turn the pages of this little book and discover other worlds, where mysterious women disguised in moth masks appear under cover of darkness, and equally elusive women display wondrous hair ornaments decorated with disconcertingly life-like insects. The girl imprisoned in a tower along with her unruly long hair is no Rapunzel, nor is the resourceful young woman saddled with a wicked step parent another Cinderella - they are prepared to rescue themselves if necessary. Beware of the 'stings in the tales' of the moth who looked like a wasp, the pessimistic trapdoor spider and the true story of the girl who wanted to paint. Two cautionary tales reveal the fates of the lazy girl and the boy who tormented animals and insects. There is all of this, and more. Illustrated with a selection of the author's prints, paintings and drawings. 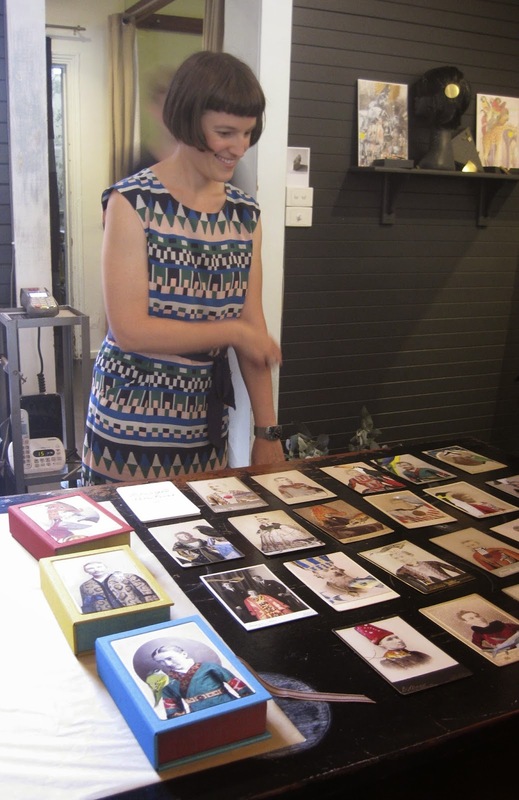 An exhibition of one-of-a-kind artist's books and miniature paintings. 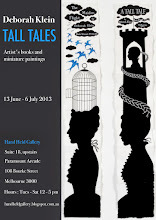 The exhibition ran from 13 June - 6 July 2013. Originally published in 'etchings', volume 10, published by Ilura Press, Melbourne, 2012. Click on image to read the complete article. All images and texts on this blog copyright © Deborah Klein unless otherwise specified. Material may not be reproduced without written permission.